Retired and active duty military members will be saluted at Churchill Downs Racetrack during the historic track’s observance of Memorial Day on a Monday, May 30 special holiday racing program that highlights the upcoming five-day Spring Meet racing week at the home of the Kentucky Derby. 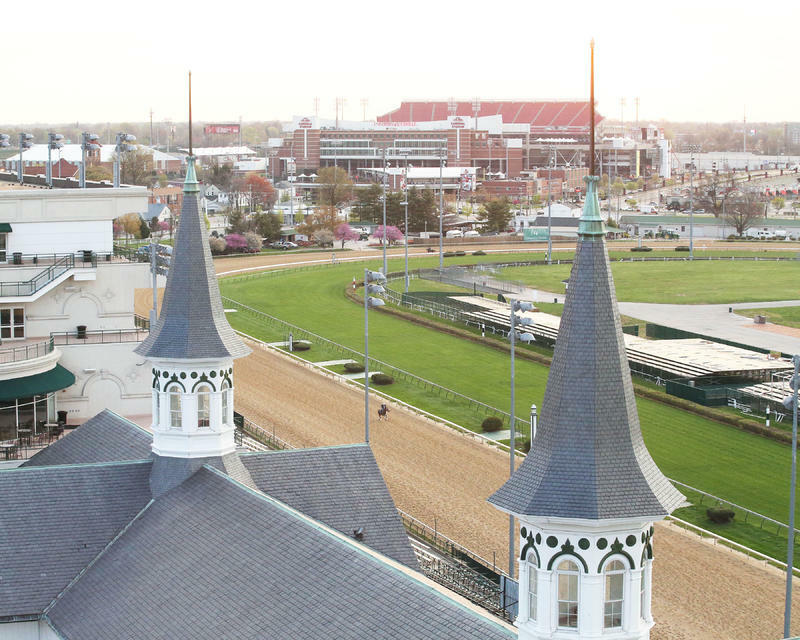 Spring Meet racing resumes at Churchill Downs on Thursday, May 25 with the weekly Twilight Thursday celebration and the week continues through Monday’s special Memorial Day program. The Spring Meet continues through Saturday, July 2. The Memorial Day program at Churchill Downs offers free general admission to the track for active duty and retired military members who present their military ID. Active military members and veterans also can obtain a special Memorial Day price of $29 for dining on Millionaires Row, reduced from the regular price of $38. The price includes admission to the track, seating and a racing program. The reduced dining ticket can be purchased at the admission gates and is available for pre-purchase by telephone only by calling Churchill Downs ticketing at (502) 646-4450. The reduced dining tickets for active duty and retired military cannot be purchased online. Churchill Downs bugler Steve Buttleman will salute the active duty and retired military members by playing songs with military and patriotic themes prior to the sound of the “Call to the Post” for each of the day’s races. Post time for the first of Monday’s 11 Memorial Day races is 12:45 p.m. (all times EDT) and the track’s admission gates are scheduled open at 11:30 a.m. It will be the only Monday racing program of the 38-day Spring Meet. The popular Twilight Thursday on May 26will launch the week of racing with live music, food trucks and $1 beers on the Plaza, which is located between the Paddock and Gate 1, with a special post time of 5 p.m. for the first of eight races. Fans can sample from a roster of popular food trucks that include ¡Holy Molé!, Longshot Lobsta, Mark’s Feed Store, Red Top Gourmet Hot Dogs and Zoom Yum while enjoying the music of Radiotronic on the Plaza Stage. The live music begins with the opening of admission gates at 4 p.m. Along with the Twilight Thursday fun, racing fans also will have the opportunity to pursue Churchill Downs’ growing Single-6 Jackpot, a 20-cent minimum wager that has an eight-day carryover total of $412,802 heading into Thursday’s program. Thursday’s Single-6 Jackpot begins with the third race, which has a scheduled post time of 5:58 p.m.
General admission to Twilight Thursdays and most Churchill Downs Spring Meet racing programs is $3, with reserved seats starting at $10. The rest of the week’s racing programs begin at the regular 12:45 p.m. post time, including a nine-race program on Friday and Saturday’s 11-race card topped by a pair of stakes events in the $100,000 Winning Colors (Grade III) and the $65,000-added Keertana. The fourth running of the Keertana, a 1 ½-mile turf race for fillies and mares ages three-and-up, is scheduled as Saturday’s sixth race and has attracted a field of eight horses. The 13th running of the Winning Colors, named for the filly that became just the third of her gender to win the Kentucky Derby when she wore the roses in 1988, is a six-furlong race for fillies and mares 3-year-olds and up. Its field of seven is headed by Seajay Racing’s Spelling Again, winner of Churchill Downs’ 2015 Chilukki (GII) and Open Mind. Others in the Winning Colors include Kaleem Shah’s Enchanting Lady, third to Taris for trainer Bob Baffert in the Humana Distaff (GI) on Kentucky Derby Day, and Robert Baker and William Mack’s Super Saks, winner of the Dream Supreme at Churchill Downs and Oaklawn Park’s Carousel. The latter is trained by Hall of Famer D. Wayne Lukas, who saddled the race’s namesake to win the Derby and become the first of his four winners of America’s greatest race. The Winning Colors is scheduled to be Saturday’s 10th race. Sunday’s 10-race program at Churchill Downs is highlighted by the second session of the Spring Meet’s “Who’s the Champ?” handicapping contest. “Who’s the Champ?” competition will be conducted in the track’s ITW at the top of the Gate 17 escalators on the second floor of the Clubhouse. Registration is scheduled from 11:30 a.m. to 1:30 p.m. and the contest based on mythical $2 wagers will focus on Races 3-8. The first-place prize in the Who’s the Champ? Contest is a $1,000 cash voucher, with a $500 voucher going to the runner-up and $200 to the contest’s third-place finisher. The handicapping contest will be conducted each Sunday through the remainder of the Spring Meet.